Gather the best feedback from your guests on a social wall! User-generated content can help scale revenue and attract more customers. Sitting in the spa and notice the towels have run out? These days, you can probably just tweet the front desk or send them a Facebook message to let them know. And they’ll appreciate knowing they have to restock. Social media is a great way for you to get immediate feedback about how the place is running. You can deal with complaints quickly but you can also react to positive comments quickly and enthusiastically. And you can refill those towels in the spa stat and impress your guests by how on-the-ball you are! You can reach new customers by engaging in relevant conversations online and using the right hashtags. And, of course, well-targeted social advertising is also a great option. Learn more about how to use relevant hashtags by reading our blog post on real-time marketing! Aside from reaching new customers, you can also keep in touch with current guests and regulars, strengthen existing relationships, and turn them into brand ambassadors who will tell others about how amazing staying at your hotel or resort was. Social media is also a great opportunity to show that you are human and that it’s easy to reach out to you. People really enjoy sharing their holidays on social media, telling others about it, showing off photos and videos. That is excellent user-generated content, and UGC is incredibly convincing. People base a lot of their buying decisions on reviews from friends, family, and people they follow on social media. You have to find a way to harness that, encourage the creation of UGC and reshare the best content with your own official accounts. Your social media accounts are the perfect way to complement your other marketing efforts by showing off what you have to offer. Instagram functions especially well as a sort of social media marketing folder. 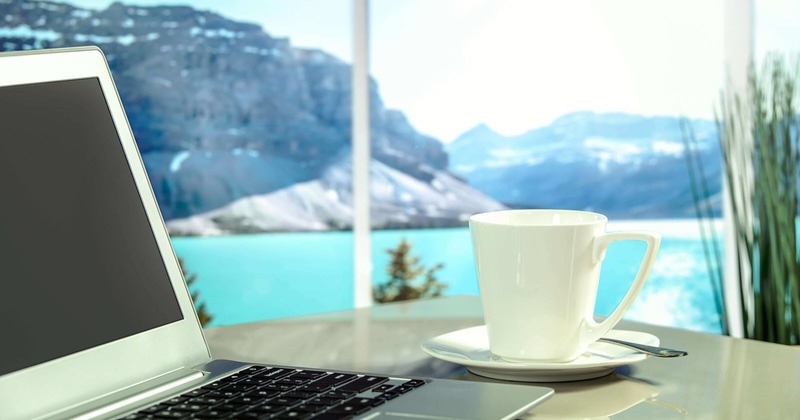 Show off your hotel’s amenities, the stellar view or whatever else makes it stand out in photos or create short videos to give a 360° view or a grand tour of the hotel. Give people a glimpse behind-the-scenes by posting a photo peeking into the kitchen or introducing the members of your staff. Posting photos, videos and introducing staff creates realistic expectations as well as a sense of familiarity, which makes it much easier for people to decide to book a stay at your hotel and not someplace else. You can also use your social media accounts to make your guests’ experience even better by providing tips for day trips, recommending local businesses and sharing other local advice pertinent to your guests. You could even offer guests an option to contact you via Facebook Messenger or Twitter direct message if they have questions. Many people will appreciate not having to go down to the front desk and at the same time, you’ll likely minimise queues at the front desk as well. Once you’ve embraced using social media for marketing and customer service tasks, you can up your game by using hashtags and social media walls to further engage guests, potential guests, and even your staff! First, set up a hashtag and a social wall and embed the wall on your website. This will give people checking out your website a great first look at what is going on. They’ll see all the great photos and video you’re posting showing off your hotel as well as the user-generated content that is being shared with your hashtag. What better way to get them to hit the “book now” button. And once you have a hashtag and social wall, the world is your oyster. Setting up a social media wall is super easy with Walls.io, and our Hashtag 101 eBook will walk you through the whole process of coming up with the right hashtag! Put a screen up in the lobby that shows the social wall and also encourages people to use the hashtag — just like Walls.io customer Arcotel Donauzentrum in Vienna has done. It’ll be great for guests to walk into the lobby and immediately see what’s going on, and it’s a wonderful way to keep people who are waiting around entertained. Put out folders and flyers as well that tell people about the hashtag and the social wall and encourage them to use the hashtag and post their own content. Tell your employees about the hashtag as well and encourage them to post their own content. Give them guidelines to make sure you get the right content. Check out our post about social media in the workplace for ideas and tips. Create a one-off hashtag campaign and offer incentives, like a free weekend at the hotel. Campaigns like that are excellent for introducing your hotel to new potential guests and get people to return. A great example of that is Walls.io customer Stock Resort. The resort in Austria has run a hashtag competition for the best summer photo, encouraging people to take pics during their stay at the resort and submit them using the hashtags. The best photo wins a 2-day stay for two. Check out the original post on the Stock Resort Facebook page. If you have a lot of regulars and returning guests another option is to create an ongoing hashtag campaign. For example, a competition for the best photo of the month wins a free weekend. An ongoing competition like that encourages people to return, to become regular guests and to keep posting loads. But even without a competition running, do make sure you show some love to the people posting pics from your hotel or resort. It’s not always about winning a prize. Most people are already thrilled to just get some recognition for what they have posted online. 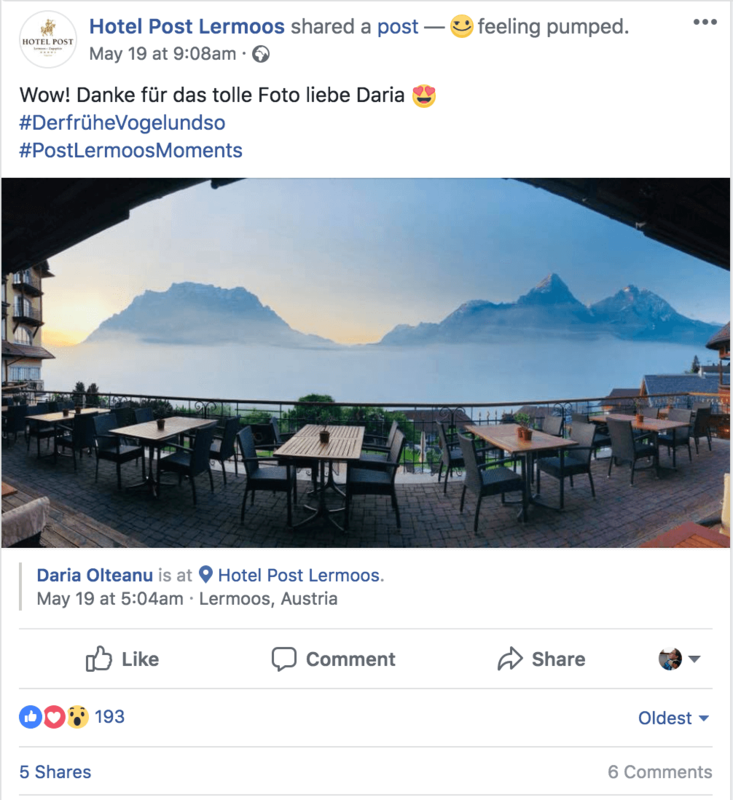 Here, Walls.io customer Hotel Post Lermoos simply takes a photo a guest has taken and shows some appreciation by posting it on their own Facebook page and thanking the guest for taking and sharing it. As you can see, Hotel Post Lermoos don’t just check for hashtagged posts but also for location check-ins, which is how they found this great pic! Check out the original post on the Hotel Post Lermoos Facebook page. Many people don’t know that a social wall can also help you generate revenue by showing sponsored ads on your social wall. Or maybe you just want to show off some collaborations you have going with other local businesses. Just show their ads or a simple logo on your social wall to alert guests to things they can do locally and ask your partner businesses to do the same for you. Whether you approach social media for your hotel carefully or go full out with a gigantic screen in your lobby and a monthly competition to win a free stay — I hope you now feel comfortable adding at least a social wall and a hashtag to your marketing arsenal. Make sure you offer good WiFi so people can easily log on and post away. This will really help you get lots of posts on your wall if you also encourage people to use the hashtag. Encourage your guests to share their experience! Give your guests a good reason to share their travel experience on social media using your hashtag. You can feature the best reviews on a social media wall in the lobby.